January 25th in Plugins For SEO by Wordpress Jedi . Most of us use WordPress themes or plugins to manage our SEO settings. Most WordPress webmasters rely on plugins such as All In One SEO, WordPress SEO, or Greg’s High Performance SEO to manage their title tags and other on-page SEO factors. Of course, if you are using a sophisticated theme framework such as Builder, Thesis, Headway, or Genesis, you already have everything you need to optimize your website for the search engines. But what if you decide to switch to another theme or platform? You shouldn’t have to enter your SEO data by hand. 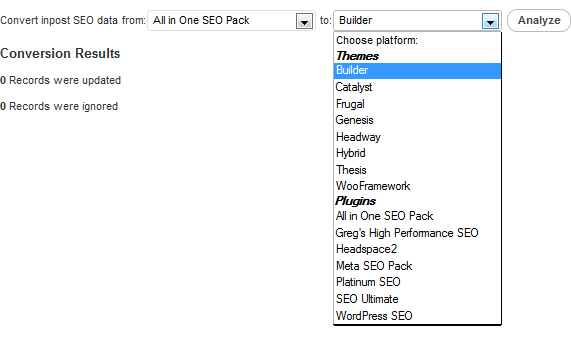 SEO Data Transporter is a handy plugin that makes transferring your SEO options from one theme/plugin to another easy. 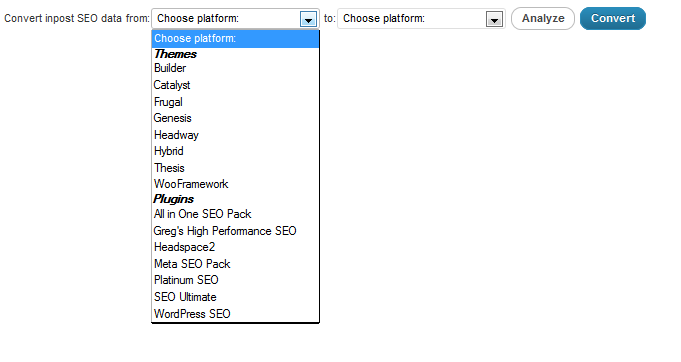 Just choose the theme and plugin you are using and the one you plan to migrate to. The rest is taken care of by the script. This is especially useful when you are moving between two very different solutions. The conversion is quite fast and fairly accurate based on our tests. If you are looking for a script to help you move your SEO data from one plugin/theme to another, you should give SEO Data Transporter a look.